The description on the carton sold me right away. I didn't see how it could be bad, but would it exceed my expectations? "Milk Chocolate Ice Cream with Peanut Buttery Swirls & Chocolate Cookie Swirls." I'm a man who likes peanut butter. I'd have to say that I like peanut butter more than any of you out there who think you like peanut butter. I once sent a Fribble back three times to have them add more peanut butter sauce at Friendly's. I told the waitress that I wanted "so much peanut butter that you think that it will make me sick." So I'm the first to try any ice creams, cookies, or snacks that fall under the peanut butter banner. But the thing is, rarely am I satisfied with them. A lot of them I enjoy, but I always just wish for more peanut butter. Well, folks, it seems like the Gods finally smiled down upon me with this flavor. Doesn't look like anything special right? First off, you have a great base. 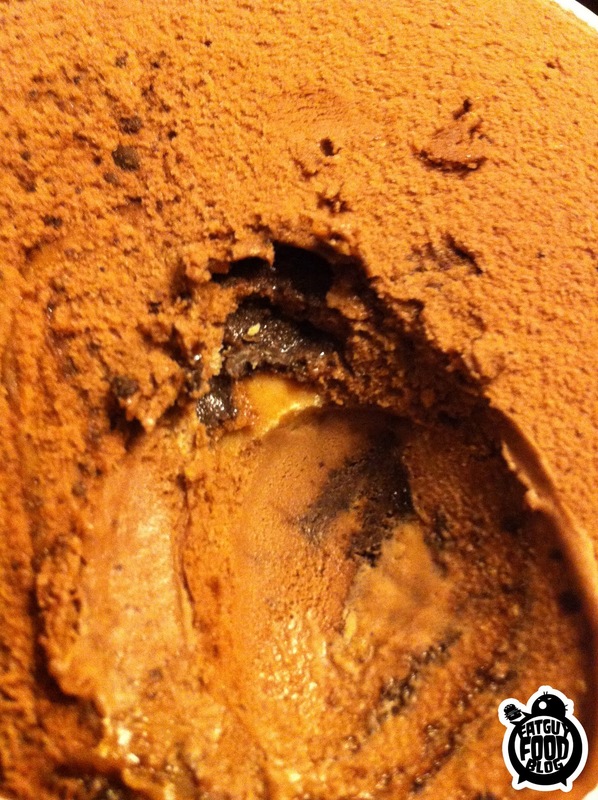 The milk chocolate ice cream is very flavorful. It's a chocolate blast. But then you dig your spoon in and it's like when you're trying to dig a hole in your back yard and your shovel hits a rock just under the surface. No rocks here, son, just a thick vein of peanut butter goodness. 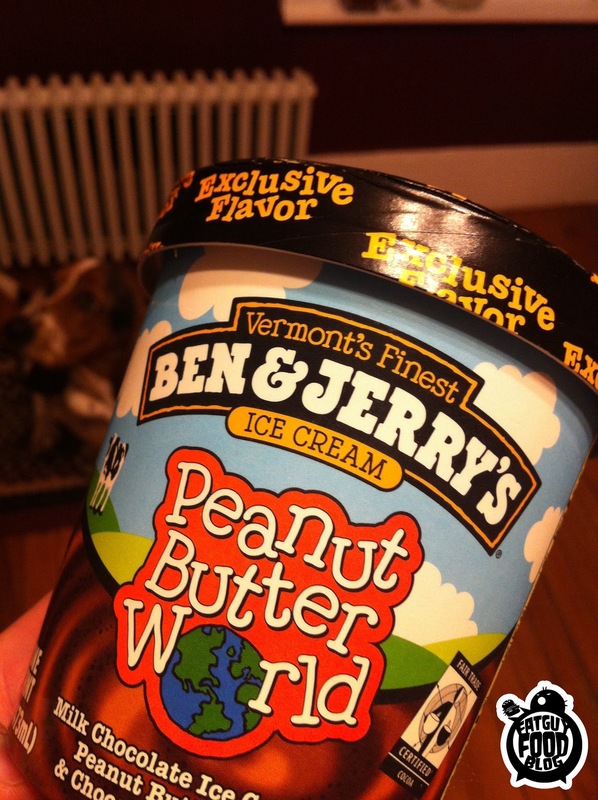 A lot of ice creams boast about their peanut butter swirls, and they have one or two running through the pint. Not this one. It is a MESS of peanut butter. 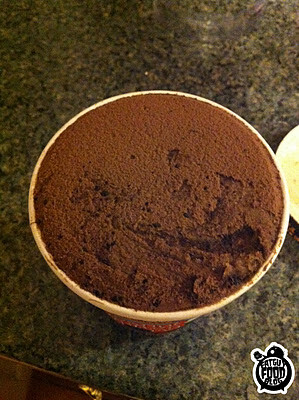 Every spoonful. is a chocolate peanut butter explosion. PB & COOKIE SWIRL...LIKE A BOSS. But that's not all, my friends. Remember Ben & Jerry's Milk & Cookies? 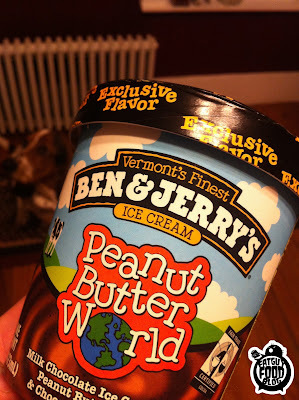 Well that cookie swirl that was part of how incredible that ice cream was...it's in Peanut Butter World too! So it's basically like someone smashed together a bucket of peanut butter and the cookies part of 100 Oreos, and then threw a few scoops of delicious chocolate ice cream in and mixed it up. It's a sickening mess of awesomeness. I could see how someone might not like this, if I really step away from it. Some people will not be able to handle this level of peanut buttery goodness. Some people are happy with just a little. For you sad, little people, I will recommend you stay away from this beast, because you will not enjoy it. It will attack your delicate taste buds and you will probably fall to the floor, choking, and whip the pint across the room, far away from you. But if you fancy yourself a lover of all things peanut butter, like myself, and find that treats usually don't live up to the level of peanut butter that you are craving... well this is the ice cream for you. 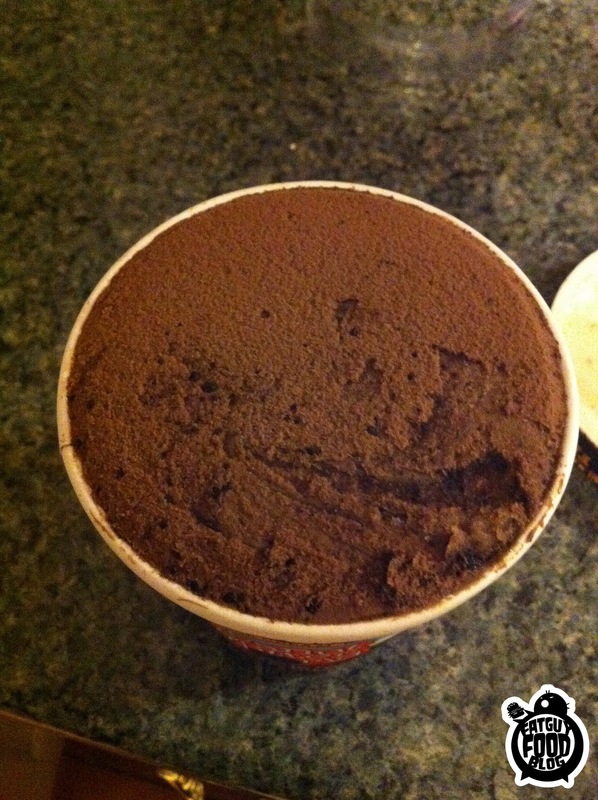 Take a trip to Target, raid their freezer section, and take a pint home with you. You'll exclaim with every bite. You'll probably hold the carton out at arms length, nodding as the first bite is melting in your mouth, brow furrowed, happiness enveloping your entire being. I give Peanut Butter World a solid A. My once fond and loving feelings for Ruffles have slowly been dying out. 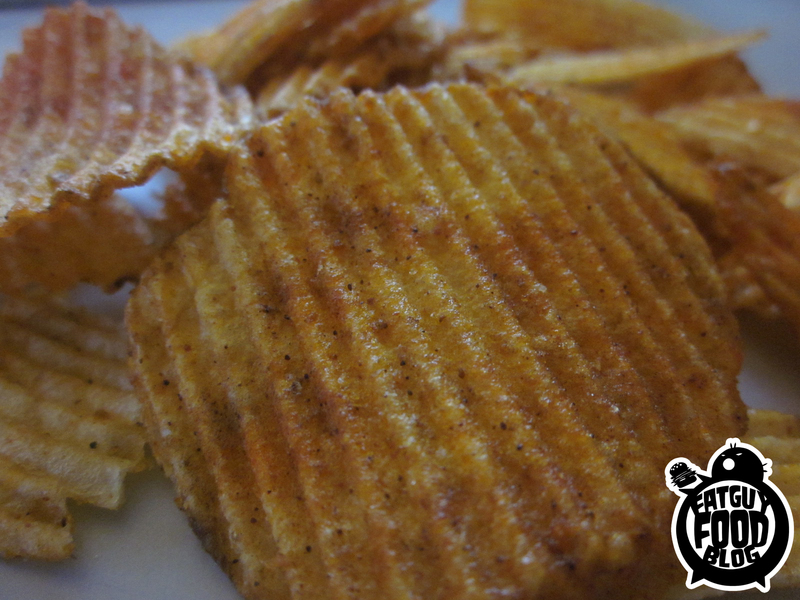 The original style are arguably the best, highest quality regular potato chips out there. Their sour cream n' onion are solid, and their cheddar and sour cream are glorious and a surefire classic in my book. 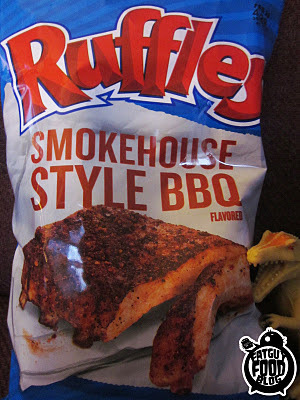 But then they made KC Masterpiece (later becoming "Authentic Barbecue") for awhile and discontinued them where I live. 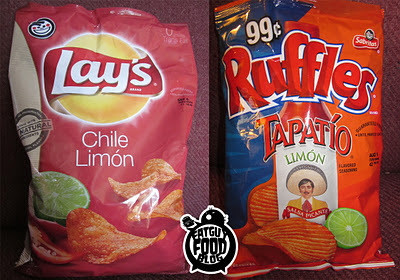 Then they created one of my favorite chips ever, The Works, and discontinued them entirely. I still cry myself to sleep most nights, mourning my loss. What followed was years of the same 3 (or 4, wherever you live in the US) flavors. I got to try "All Dressed" when I was in Canada, but basically there were no new flavors for years. Then this summer, someone at Ruffles clearly lost their mind, and in addition to a "vote for the new flavor" contest, they created a short list of either fairly gross flavors or decent ones that mostly disappeared nearly as fast as they appeared. We have reviewed them all. Actually, that's not true- we didn't review "double fisted cheeseburger" but they were about as good as the amount of time they lasted on the shelves (not sure if that makes sense, but you get the idea). So, based on the last year, when I saw a new bag at the store with a giant slab of meat on it, I was prepared for the worst. Seriously, Ruffles? You're making MORE chips that taste like meat? Didn't you learn your lesson before? UGHKK. These chips are AWESOME. They aren't meat chips- they're just BBQ, and excellent BBQ at that. They taste a lot like their Authentic Barbecue (at least how I remember them), but with an extra smokiness. 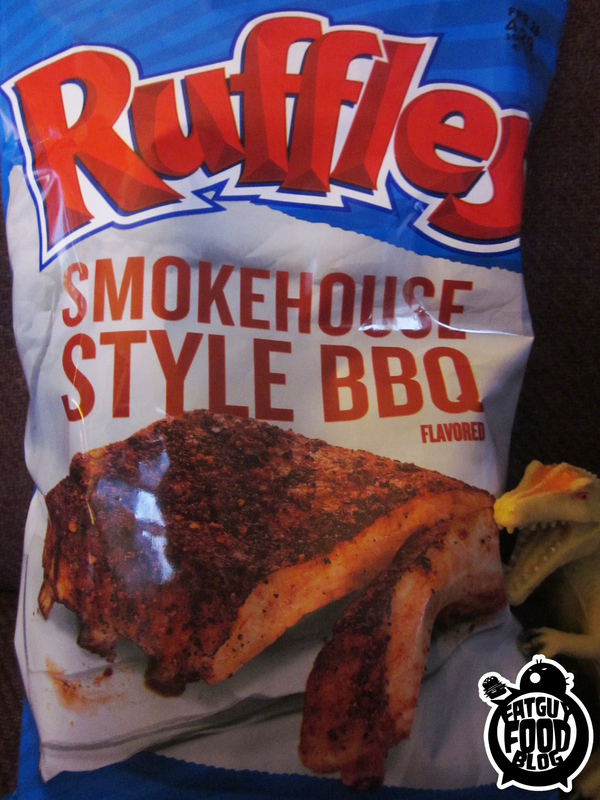 They describe it as "lip smakin' dry-rub style BBQ," meaning that I guess the best way to imagine the flavor is if all that crunchy BBQ rub on the ribs in the picture on the bag was rubbed on chips instead of ribs, then that's the flavor you're getting. Even though that sentence was atrocious, I think that may be a fairly accurate representation of these chips. 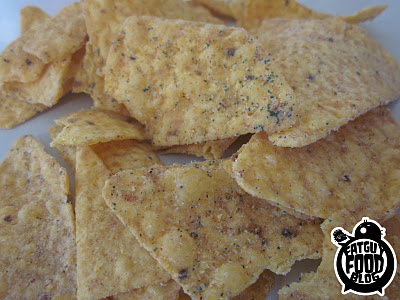 They're sweet and tangy like the best BBQ chips, but there's an extra smokiness and spice- a real kick- that other chips don't have as much. And they definitely give you a good mouthburn after awhile. We haven't seen these in NH yet (I got them at a Hannaford in Maine), but if you see a bag, buy 4. Buy them for your friends and an extra bag for you. I destroyed a bag without even trying and immediately wanted more. 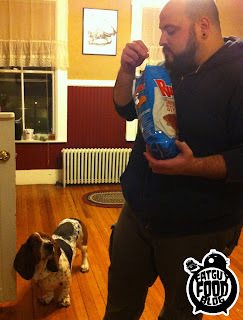 I got a bag each for the other fatguyfoodbloggers, and they both made the face that can only be made when a fat guy finds a new favorite. And, based on Ruffles' track record lately (and the fact that I follow them on facebook and they never said a word about these chips even existing- what's with that? ), I can only assume these will be extremely limited edition. 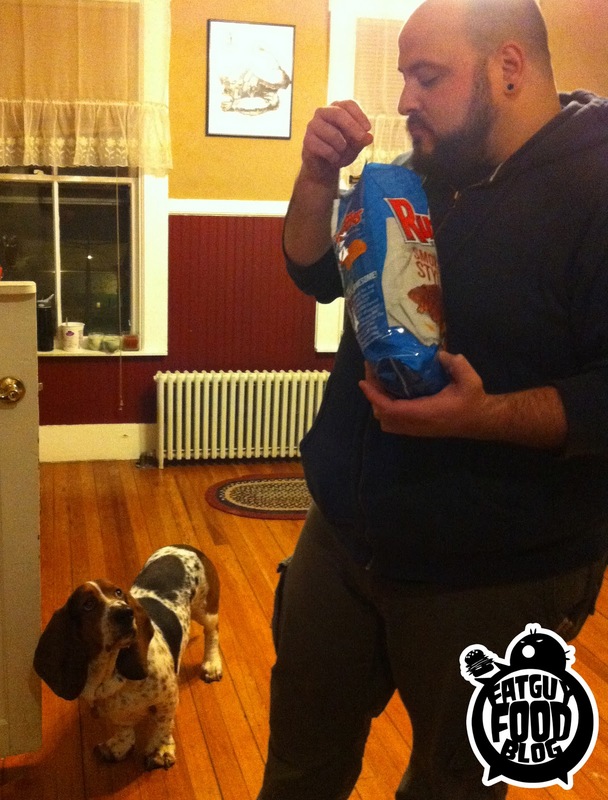 Buy a ton so Ruffles will see the appeal and make more! I really hope these stick around, they're excellent. Until then, I'm sorry if I knock you over and steal bags out of your shopping cart when you finally find them. I hope you understand. 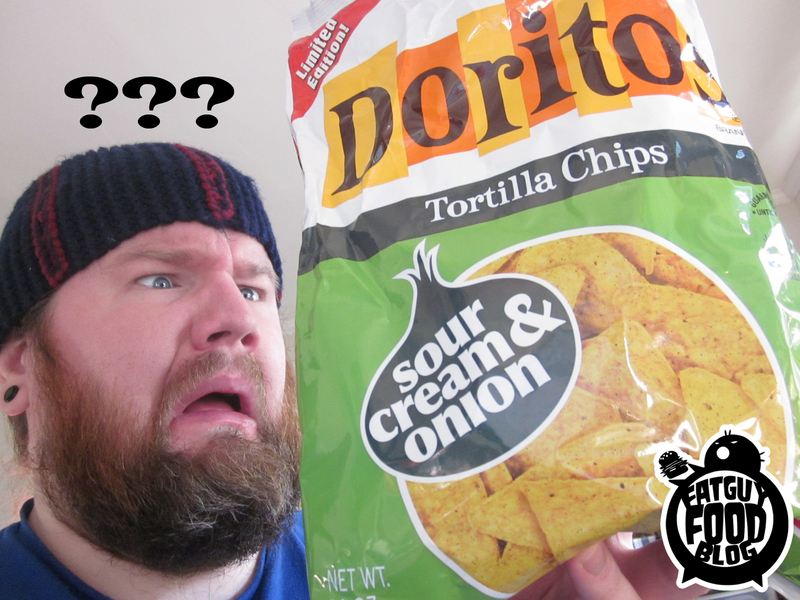 Sour Cream & Onion Doritos?! 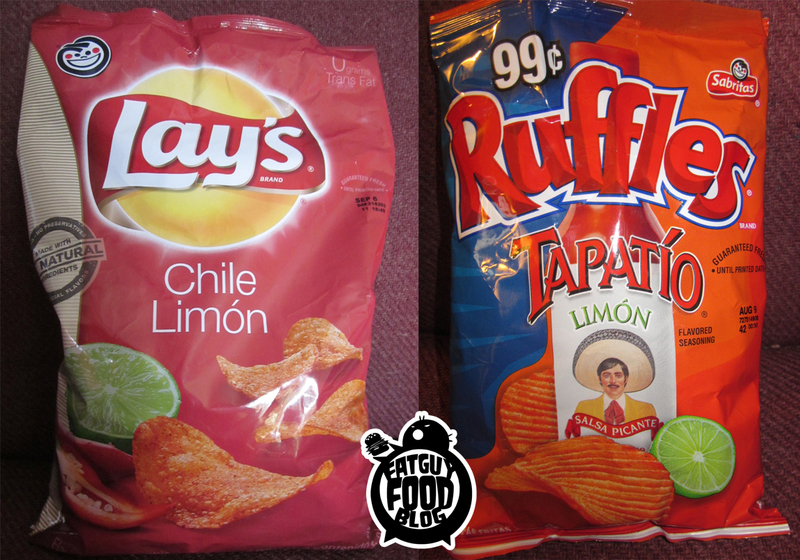 Being the chip hog that I am, I often spend time on the internets searching to see if weird flavors of chips exist in vast corners of the US or other countries. One late night, a question that had somehow never entered my mind finally did- how come there are Sour Cream & Onion flavored chips for virtually every chip company, but Doritos don't have them? 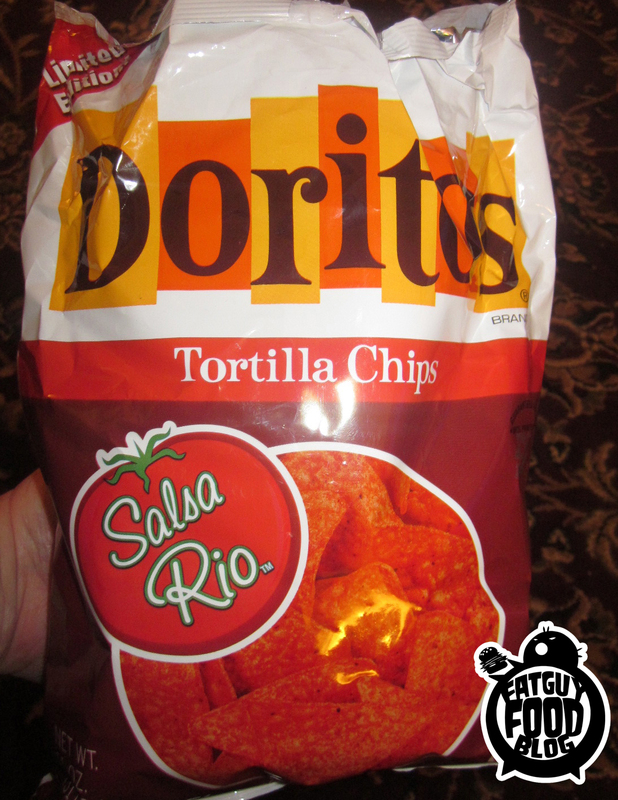 Granted, Fritos don't either, but Fritos hate trying new flavors. Doritos LOVES putting out every flavor imaginable. I looked into it, and apparently 20 years ago, such a thing existed. Who knew? 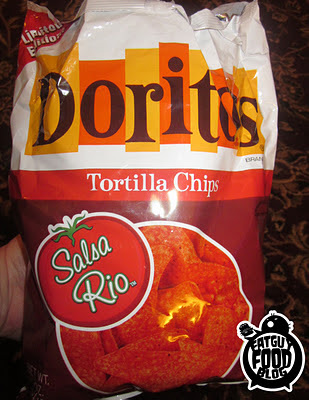 According to the Wikipedias, Doritos started with Taco flavor in 1964, which recently returned and aren't very good in my opinion (although very accurate tasting). They then launched the classic Nacho Cheese, then Sour Cream & Onion around 1970, to be discontinued later. They didn't launch Cool Ranch until 1986! It took them 18 years to create that flavor?! Crazy. So, I wondered if somehow, with the resurgence of some classic flavors, we may be granted the privilege to some day taste a flavor that hasn't been around in over 20 years. And then it happened. One fateful day while roaming the halls of a Market Basket I never go to, I saw something I didn't think I ever would. They had returned. After texting my friend who works there an angry, profanity-laden "HOW DID YOU NOT TELL ME!?" freakout, I bought them and went home to violently tear into the bag. They're pretty covered in flavor. The first reaction for all 3 of us fatguyfoodbloggers was that they just tasted like an odd version of Cool Ranch- they definitely have some of the same spice. I don't know if it's that the sour cream they use tastes a lot like ranch, or the spice that the Ranch have is very close to the spice that these have, but the flavors are oddly close. And what's with a Sour Cream & Onion chip having a spice? Isn't this supposed to be a smooth, creamy taste? They definitely went with a more sharp onion taste, and it's weird. The weirdest thing about these is that the chip itself felt cheap- like a Doritos imitation. Compared to other Doritos, these definitely feel thinner, cheaper, more corny, and just not as good. I don't know what's going on here, but I don't like it. So, to recap- cheap, thin imitation-esque chips, Cool Ranch-esque spicy flavor that doesn't really taste like Sour Cream & Onion, not to mention that corn chips and this flavor just doesn't seem to work. I think I pretty easily can see why these were discontinued. Too bad, it's something I've wanted to try for awhile, and there were probably a lot of old fat guys who were really excited about this. Oh well. I will forever applaud Doritos and their adventurous attitude in doing the one thing every chip company should- putting out new flavors. But this proves the sad truth that they just can't all be winners. Too bad. If you're crazy for chips, you're gonna try them anyway (especially since they are limited edition), but you'll be disappointed like me. They're interesting, but they're just not very good. If you like that flavor or are at least intrigued by it, then get these- the flavor is less limey and more subtle. It also worked better with the Doritos corn chip flavor than the others. But for this reviewer? Not interested. There's 90% of a bag about to go in the trash. I have no idea what people see in salsa combined with lime. It just tasted like salsa with soap spilled in it to me. Well once again the holiday season has come and gone, and hopefully yours found you stuffed with all your favorite holiday treats. Ours did. We were in a candy, ham, and egg nog daze that went on for a couple of weeks. We've just now awoken and stumbled back into the real world. Whats the first thing we do? Hit the store and find something to blog about. I know what you're thinking...Another cereal post? Really? 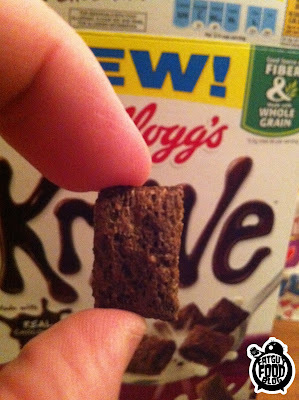 Wait...and this one is a DOUBLE cereal post?! Yup. First off a cereal that I've been waiting for since the first day Cheerios debuted Honey Nut Cheerios. I remember saying, "Hmm. these are decent. You know what would be good though? PEANUT BUTTER CHEERIOS!" Well now, 50 years later (not really) General Mills finally answers the call. So does it live up to the wait? 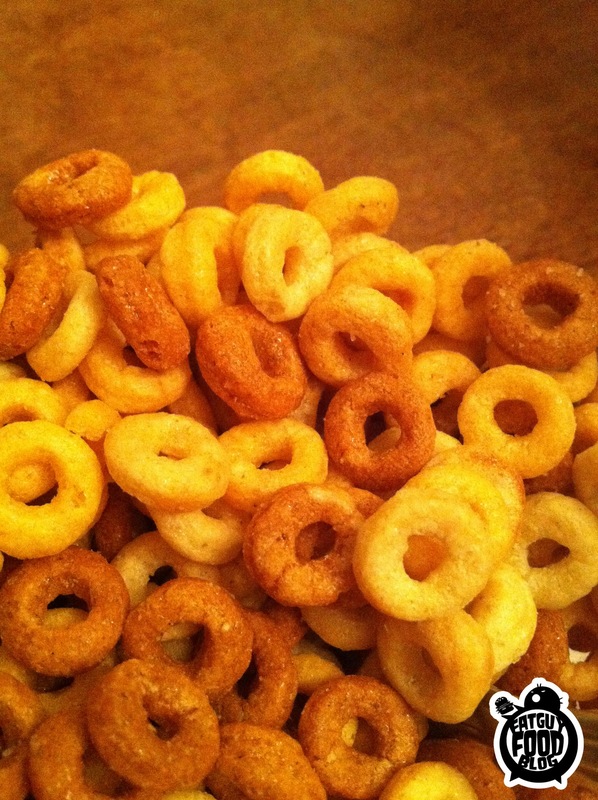 Looks like multi grain Cheerios, right? It's pretty good! The smell is like a peanut butter slap to your face and you get excited, like you might be dealing with something way better than you could ever expected. But then you taste it and realize, yeah....It's Cheerios, but peanut butter. The flavor is there but it's more subtle than you would like. You want it to kick up a few notches but where it lands is still pretty good. When milk is added, the peanut butter flavor gets even weaker, but it's still a good bowl of cereal that you can eat and not feel gross after. I say if you're a fan of Cheerios and enjoy peanut butter flavored treats, give these a try. 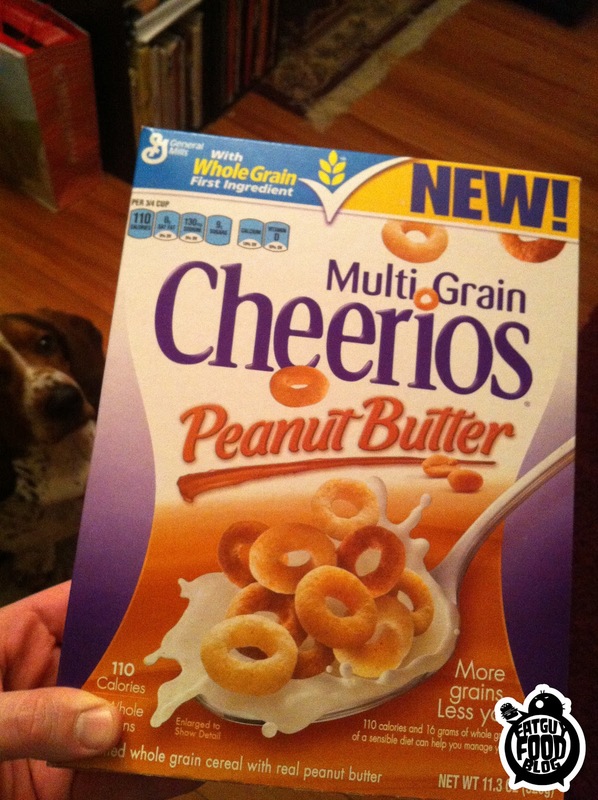 I give them a B, for "Better than Honey Nut Cheerios." 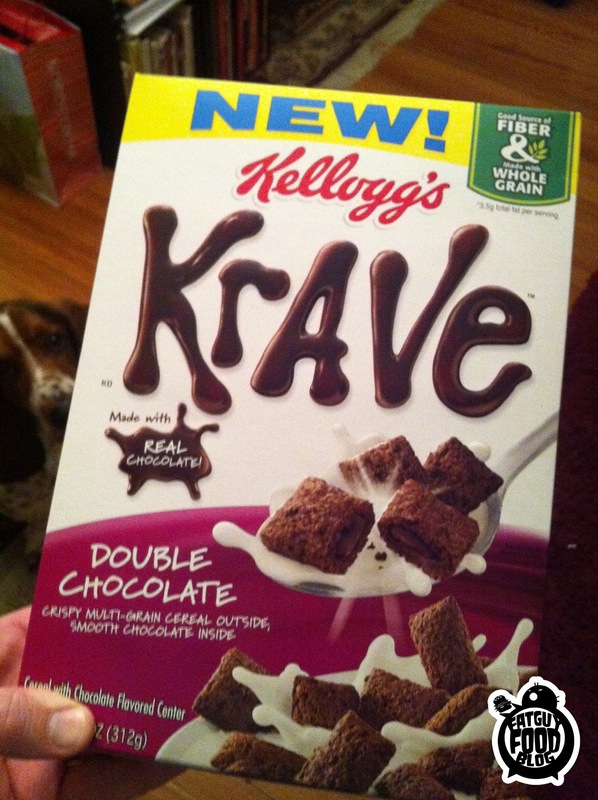 Next up is KRAVE. I had never heard of these. Never had any idea that they even existed until I wandered around the island of new cereals at my local Walmart. My arms were already filled with boxes of Peanut butter Cheerios but I still managed to scoop one of these up. I'll tell you what...I'm glad I did. I was actually expecting these to be just okay. I thought they would be a run of the mill chocolate cereal but a review would be a good idea because they were so new and shiny! 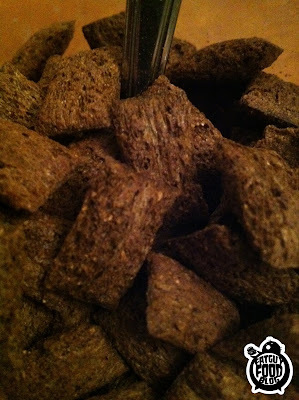 The box boasts that they are "Crispy Multi-Grain cereal outside, and smooth chocolate inside." Straight out of the box they are decent. They crunch and then there's a legit chocolate blast inside. But the real awesomeness kicks in the moment you add the milk. When milk hits them they are instantly kind of soggy. But it's not a bad soggy. It's almost like the edges stay crunchy but the middle gets soggy and the gooey chocolate inside is somehow intensified by the milk. It literally tastes like you are eating the gooiest chocolate brownie of all time, and washing it down with a swig of cold milk. It's heaven in a bowl. It's more like dessert than breakfast, but mother of god is it good. I had two bowls back to back and then forced someone else to have a bowl so they could share in it's awesomeness. I give KRAVE an A for "Awwwwwwwww shiiiiiiiiiiiiiiii this is good!"